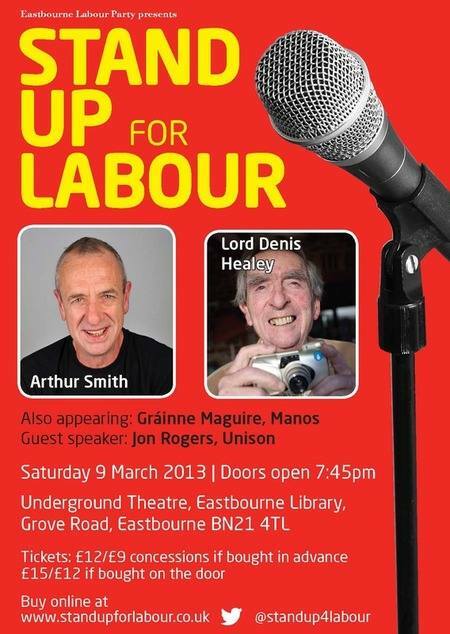 Stand up for Labour's event in Eastbourne features former Chancellor of the Exchequer Lord Denis Healey and grumpy old man Arthur Smith. Also appearing will be Gráinne Maguire, who performed at last year's Labour Party conference and Manos, who went down a storm at the Ilford event in December. The evening takes place on Saturday 9 March at the Underground Theatre and starts at 8pm.